A day after spy photos of the Swift appeared from Hungary, Suzuki has released official images of the redesigned 2011 Swift. This new model, which goes on sale in the UK this fall, will get 47 mpg (U.S. cycle), and be powered by 93 horsepower 1.2-liter gasoline engine. Although smaller than the outgoing 1.3 liter mill, it's more powerful and gets better fuel economy. And even though the wheelbase is longer than the previous model, as Autoblog.com points out, the Swift is still 9.5 inches shorter than the new Ford Fiesta. So now the big question looms: Will the Swift appear in the U.S.? Autoblog reports there are no official plans at this point. And although it's true thatAmerican Suzuki has not made an official announcement about the Swift in the U.S. since 2007 (which is when they said it'd be here by 2010), there has been a lot of speculation that this smallish Suzuki will show up on U.S. soil. Personally, I don't think Suzuki can afford not to bring the Swift over here (unless they, literally cannot afford to bring it here). With its sales down nearly 20% each month for several months, the company needs to try something else. Although the Kizashi is a fine sedan that has much praise from the automotive media (including in my review), it hasn't been selling very well. Albeit, sales have been increasing a little each month. But cash-strapped Suzuki (at least in the U.S., well only in the U.S.) needs a car to get people in the door. Although the SX4—another favorite of mine—is a good car, and actually based on the outgoing Swift's chassis, it may still be too niche for some, plus the AWD models get unfairly pegged for its fuel economy. Perhaps the Swift could be an inexpensive way to get people to look at Suzuki again. Look at the Versa. The Aveo. The Accent. The Yaris. The Fit. These are all the entry-level models, and all sell pretty well for subcompacts. The SX4 currently doesn't come anywhere close to the sales numbers of these vehicles. But, if Suzuki can offer the Swift at a very attractive price, stand by it with it's 100,000 mile powertrain warranty, and promote it, I'd think it'd have a winner on its hands. It seemed to work for the above-mentioned subcompacts. Then you've got Suzuki's small (and getting smaller) dealer network. It's hard to sell a lot of cars when you don't have a lot of dealers. Then gain, it's hard to have a lot of dealers if you don't sell a lot of cars. Hopefully, American Suzuki Motor Corporation decides to give the Swift the thumbs up for the U.S. market, and perhaps Suzuki can right the ship. Thanks to Sean Murphy for the tip! In the rejuvenation of Suzuki in the United States, the Kizashi is a great start but it alone cannot revive the brand. 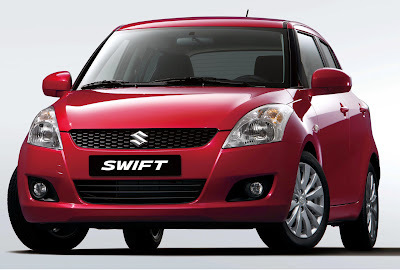 The Swift would be a great next step that surely will bring some traffic into Suzuki's dealerships. Hopefully they can follow up with a new Jimny a.k.a. Samurai to lure the sales Jeep has lost as the Wrangler has gone upmarket and grown too big and thirsty. Very well put. I agree that the Kizashi, or any one car, isn't going to save the brand. They need to build up a portfolio of good cars. I don't know why, but I often look to Subaru as an example. Back in the early 1990s, they had the Loyale and the Justy, and a couple of other ho-hum models. However, they introduced the Legacy, then the Impreza, the SVX and started to increase their brand awareness. Now, I don't know if Subaru was ever in as dire of a sales situation as Suzuki, but I can't help but think of Subaru when I think of brand building. I demand the Swift Sport be brought to the states immediately! My fiance is actually considering a mini cooper! I can't let that happen. According to Left Lane, Suzuki's New Tie up with VW has created a powertrain dispute that threatens to hold Swift back from a US Debut. According to my sources, Swift for the US Market will get Gas Direct Injection with Phenomenal Fuel Economy and Horsepower. VW cant allow this car to be better than their Polo is probably the real reason behind this powertrain dispute. That's very interesting. I've seen a preview of the new Polo sedan; I wonder if the U.S. will only get the Polo sedan, and Suzuki will get the Swift hatchback? I personally think that their dire financial situation can't be reversed without improving the terrible dealer network. The closest one from my house is nearly 35 miles away. I don't think the Swift would help them anyway. For the money, it wouldn't even come up on my radar. Honda Fit, the new upcoming Accent, Mazda2, and Fiesta would be, though. All are arguably much better cars with a stronger dealer network and a better, stronger brand. "All are arguably much better cars with a stronger dealer network and a better, stronger brand." I'm with you on the network and brand, but certainly not "better cars." The Swift has been one of the most acclaimed vehicles in Europe in terms of b-segment vehicles. The problem is, though, how do you expand your dealer network if you aren't selling many cars? It's a "chicken/egg" situation.